babus of india: No Affidavits Please: Can GoI prevent a loss of Rs 8,000 crore by following Punjab model? No Affidavits Please: Can GoI prevent a loss of Rs 8,000 crore by following Punjab model? THREE years ago, the government of Punjab abolished affidavit raj prevalent in ministries and state PSUs so that it could shed the tag of what it calls a “mai‐baap sarkar”. Instead, it wished to move towards “participatory governance”. With the Punjab model being discussed now in the Central government’s department of administrative reforms and public grievances (DARPG), there are speculations that…such a practice could finally be adopted by other state governments and even by the Centre. 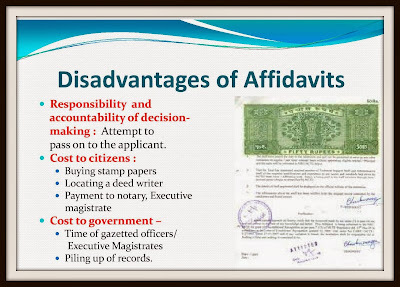 According to estimates, about 20 crore affidavits are being made every year in the country, and the process results into an economic loss of about Rs 8,000 crore, taking an average of Rs 400 per affidavit. Punjab government’s “affidavit-free regime” notified three years ago, called for affidavit’s replacement with self-attested declaration for all need-based services. What citizens need to do there is to fill up a self-attested form containing a self-declaration after affixing his or her photograph. It all began with the recommendations of Punjab Governance Reforms Commission, set up in January 2009. Its recommendations were then scrutinized by an empowered panel headed by the state chief secretary before finalizing the new policy. The Commission argued that the affidavit raj presupposes that all citizens are "cheats and frauds" unless proven otherwise, and hence a declaration is accepted only if a gazetted officer, oath commissioner or executive magistrate attests it. Interestingly, the opposite is also true. Citizens too don’t trust their own government regarding its efficiency of timely and hassle-free delivery of services. And this mistrust from both ends results into the need of such affidavits. 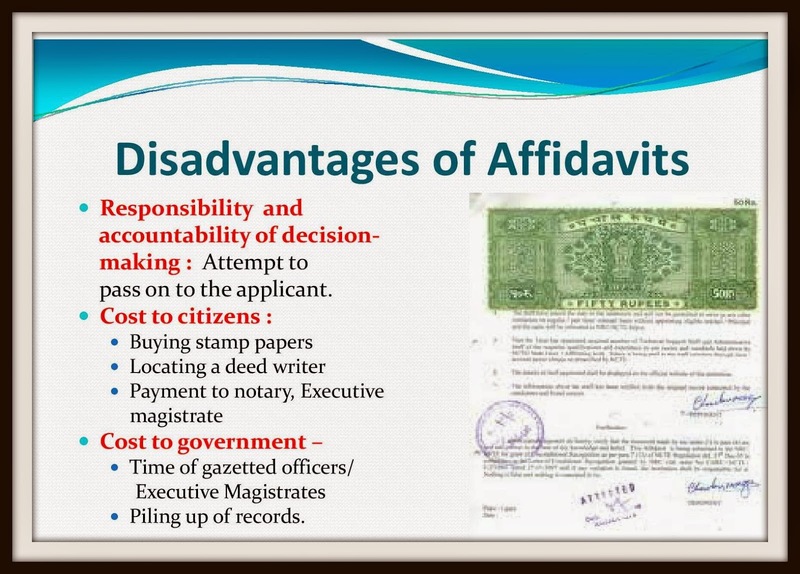 But take a look at the hassles and costs associated with affidavits. A citizens needs to buy stamp papers, locate a deed writer, make a payment to the notary and executive magistrate etc. It has a cost to the government as well. Gazetted officers or executive magistrates need to spend time, and many government offices have no clue about how to keep the piled up records.So, isn't affidavit-free-regime more desirable? A simple and intelligent change that will make a big difference to governance processes. Its time the LLBs start looking for better things to do.